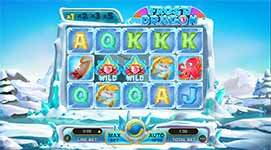 Discover the magic of Frost Dragon Slot - Slotorama! Review of: Discover the magic of Frost Dragon Slot at Slotorama! Travel across an ancient frozen tundra with a majestic creature guiding you to treasures in Frost Dragon online slot by Gameplay Interactive! You'll be spinning across 5-reels and 20-lines where you can win big with bonus features that include a wild, scatter wins, free spins bonus feature and Down Rush Reel Mode! Travel across an ancient frozen tundra with a majestic creature guiding you to treasures in Frost Dragon online slot by Gameplay Interactive! You’ll be spinning across 5-reels and 20-lines where you can win big with bonus features that include a wild, scatter wins, free spins bonus feature and Down Rush Reel Mode! Wild Symbol – The wild substitutes for all symbols except the scatter. Wilds appear on reels 2, 3 and 4 to complete wins. On reel 3 the wild will appear stacked for more chances to form winning combinations. Dragon Scatters – Three scatters from leftmost reel to the right triggers the free spins feature. Scatters are found on reels 1, 2 and 3. Free Spins Bonus – Three scatters from leftmost reel to right triggers the free spins feature where you will win 10 free spins. Free spins can be re-triggered. The Down Rush Reel Mode is enabled during free spins. Down Rush Reel Mode – Winning symbols are removed and new symbols fall down from top to bottom to fill gaps. Down rush reel mode activate both on main game and free spins. During main game, downrush reels can award multipliers including x1, x2, x3 and x5. During free spins the multipliers increase to x3, x6, x9 and x15.